Artisan Farmstead Cheese, much like wine, has a definite terroir. The land, the air, the weather and the feed of the animals influence its flavor. It is shaped at the hands of an artisan who cares for the animals, the land, and the people who help her craft each wheel. This is a story of our visit to Cowgirl Creamery and its distribution arm, Tomales Bay Distributing, where we buy many of the cheeses for Fancifull. Their purpose is to support the fine art of farmstead cheese making from small scale producers so we all can enjoy a wide range of distinctive cheeses that are full of nuance and flavor, help to insure jobs in rural areas, and contribute to the protection of farmlands from development. This was a pilgrimage. "Today, I am making Red Hawk Cheese with help from my friends," said the scrawl on the blackboard as we walked through the swinging doors into the refreshing cool of The Cowgirl Creamery. We arrived early so we could survey the scene. We knew this to be the home of one of our most popular cheeses, and the first organic cheeses in California. What surprised us was that Tomales Bay Distributing is also housed here along with a wonderful market filled with fruit, cheeses -duh!-, and a whole deli section where we found some flavorful cold tomato and cucumber soup that we brought to a picnic at Hog Island Oysters. If you are up in the Bay Area, Point Reyes Station is about 30 minutes north of San Francisco it is worth the stop just to see cheese being made and to talk to the friendly and knowledgeable people who make up Tomales Bay Foods. If you decide to take the Cheese Tour you will be greeted by Ranger Nan, a former park ranger who is bursting with pride in the Creamery. Reminiscent of summer camp we sat around the wood table under the window that looked over the two-person cheese making operation and listened while Nan regaled us with the history of the Creamery. We were given the opportunity to help make the cheese (I got to stir the curds), as well as taste all the varieties. Yum! I am personally hooked on the creamy punir, which I am working to bring into the shop; it has a very limited shelf life. Beginning with their cottage cheese and advancing through to their washed rind Red Hawk we savored up each sample -or samples since some of us are piggier than others -as Nan explained the cheese making process of each one. What I didn't know is that Cowgirl Creamery is the brainchild of Susan Conley of Bette's Diner in Berkeley (the best pancake mix on the market) and Peggy Smith who was a chef at Chez Panisse, trained by Alice Waters. Sue had sold the diner and decided, abruptly, as it is told, in 1997 to make artisan cheese. She talked to the Strauss Family Farm, the only producer of Organic Milk in that area, and the rest is history. Of course there is the traveling through Europe to visit cheese makers, converting the old barn to a creamery and then setting up a distribution system so other artisan cheese makers would have an outlet for their cheese. After our tutorial, it seemed the whole cheese department was up for grabs. 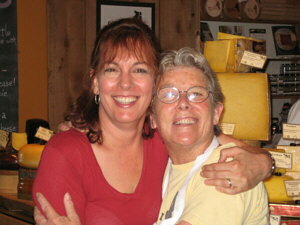 We tried aged Gouda, Irish Cheddar, local goat cheese; all distributed through Tomales Bay. The generosity of the staff seemed unending, their enthusiasm contagious. So stop by and grab a little of this artisan cheese for yourself. We are enthralled with the flavors and textures as well as their commitment to the planet and the people on it.